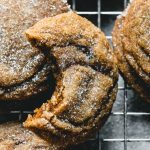 Soft & Chewy Gingerbread Men Cookies are perfectly spiced with molasses, cinnamon, ginger and other warm spices, and sweetened with brown sugar. The best way to spread Christmas cheer might be singing out loud for all to hear, but these cute little fellas come in a close second! 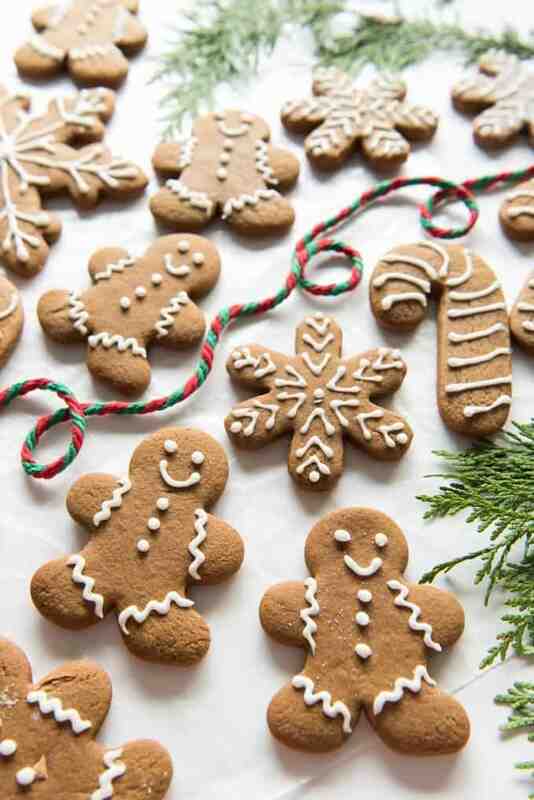 Soft & Chewy Gingerbread Men Cookies are part of my personal Christmas cookie trifecta. The other two cookies are these perfect peanut butter blossoms and classic sugar cookies decorated with frosting and sprinkles or M&Ms. Although I have been making a chocolate peppermint cookie for a couple of years now that keeps inching it’s way up on my list of “must bakes” each Christmas season. 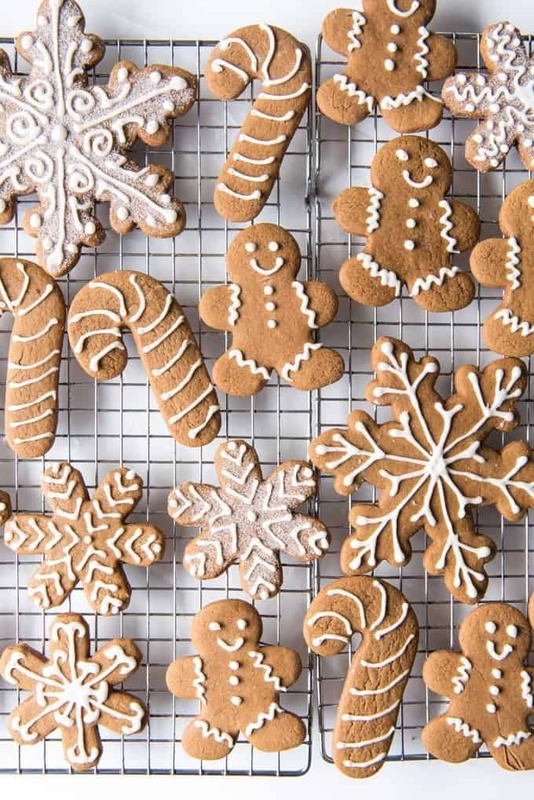 Even though gingerbread is a classic Christmas cookie, it’s not one I grew up with. In fact, I don’t even remember ever having had a gingerbread cookie until probably 8 or 9 years ago when I just started searching for a gingerbread cookie recipe on a whim. I’m not sure where my original recipe came from since those were the days before most food blogs really got started and I definitely wasn’t keeping track of sources anyway, but since then I’ve made small adjustments to the flour-to-butter-to-spice ratio, tweaking things just a bit here and there to yield the most perfect soft & chewy gingerbread men cookies you can imagine. Just the aroma of the molasses and cloves and ginger and cinnamon is enough to transport you to Santa’s workshop and make you feel like one of his baker elves. 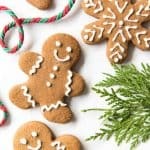 This is such a fun Christmas baking tradition to make with my girls because we turn on Christmas music and they love to help use the gingerbread men cookie cutters. 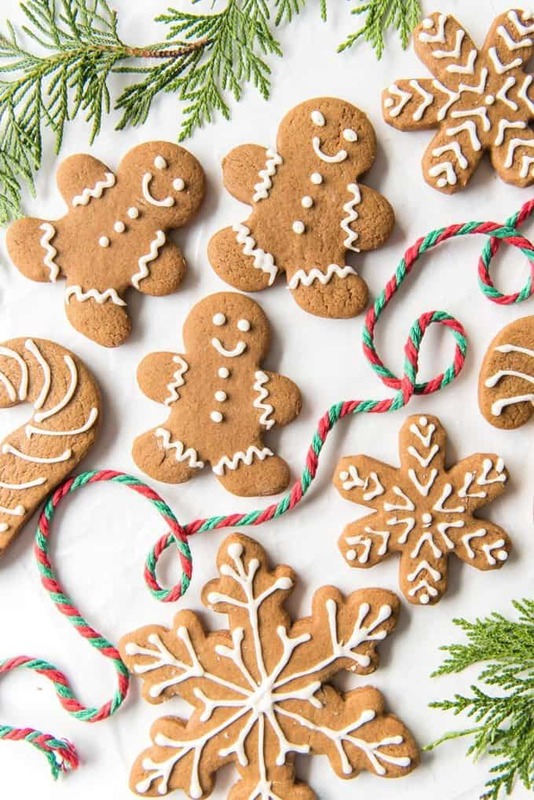 Although you can obviously use whatever cookie cutters you like or even cut out house shapes with a sharp knife to make 2-D gingerbread cookie houses that you can decorate with candy and eat (unlike the hard gingerbread houses that are just for decorating). I’m partial to gingerbread snowflakes and like to sprinkle them with plain ol’ granulated sugar after frosting them with royal icing. 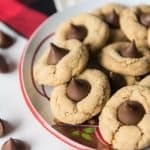 Just be aware that while the recipe says to bake the cookies for 9-10 minutes, you might need a little more or less time depending on whether your cookie cutters are small or extra large. I have a few really big tree and train cookie cutters that I have used in the past and those gingerbread cookies take more like 11-12 minutes to bake. Tiny cookie cutters take more like 8 minutes in the oven. 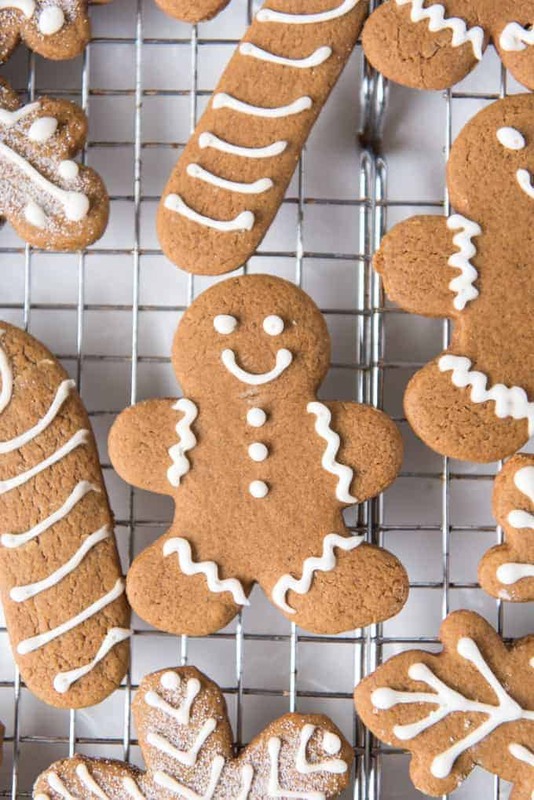 But the regular size cookie cutters that you are most likely to use will give you perfect soft & chewy gingerbread men cookies right around the 9-10 minute mark every time. 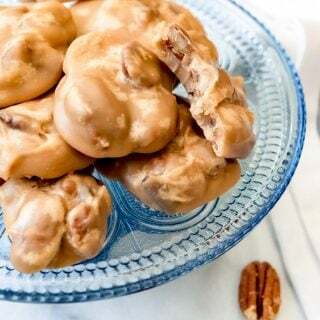 The royal icing is super simple to make with just a little corn syrup for shine and no messing around with meringue powder (which I can never find in the store anyway). You can use a piping bag with a small tip for decorating or do what I always do and just fill a freezer safe ziploc bag with your royal icing and then snip off one of the corners with scissors. Just don’t snip off too much. While these gingerbread men are perfect for eating all by themselves, they also make AMAZING ice cream sandwiches if you want to put a little vanilla or strawberry ice cream between two of them. Seriously, those gingerbread ice cream sandwiches are my favorite! In the bowl of a stand mixer, cream together the butter and brown sugar until smooth. Add the molasses (it really does help to spray your measuring cup with cooking spray before measuring the molasses - it will pour out more easily afterwards) and egg and mix again to combine, scraping down the sides of the bowl as needed. Add the flour, salt, baking soda, and spices, then mix until everything is completely combined. Scrape the gingerbread cookie dough out of the bowl onto a large piece of plastic wrap, then wrap it up into a disc and put it in the refrigerator to chill for 3 hours or even overnight. Preheat the oven to 350 degrees and line a cookie sheet with parchment paper. On a floured surface, roll the dough out to 1/4" thickness. I always find I need to be generous with the flour so the cookies don't stick to the counter or the rolling pin, but you don't need to worry about having cookies that look dusted by flour because it will be absorbed into the dough as the cookies get rolled out. Cut into desired shapes with cookie cutters. Transfer the cookies to the baking sheets, leaving a little space between each cookie. They don't spread much, but you just don't want them touching while they are baking. Bake for about 10 minutes until they just start to look set but do not overbake or they won't stay soft. Let cool for 5-10 minutes on the pan. Remove from cookie sheets to cool completely on wire racks. Frost or decorate when cool with royal icing. In a medium bowl, whisk together the powdered sugar, vanilla, corn syrup and 2 tablespoons of the water. If should be thick, but if it is TOO thick, whisk in another 1/2 tablespoon at a time, checking consistency after each half tablespoon. If you go too far and it gets too runny, whisk in two additional tablespoons of powdered sugar at a time. You want the royal icing to drizzle off you whisk into the bowl and hold it's shape for a second or two before melting back into the rest of the icing. If desired, you can separate your icing to different small bowls at this point and add food coloring, then transfer to piping bags with small decorating tips. OMIT THE CLOVES. I tried this recipe (I would say I’m a baking novice but not total beginner) and baked half of it. The rest is going to be frozen and used as a weapon of protection. Is it just me? On the plus the house smells really nice but the cookies are just not right, edible but very strong taste and super dark. I’m sorry you felt like these were too spicy! The strong cloves are one of my favorite parts about this cookie because so much gingerbread is so bland! That is hard to say because cutters can be so different, but it is a big batch of cookie dough. I would say probably 4 dozen cookies. Next time I will try to use consistent shapes (my snowflakes are much bigger than my gingerbread men) and keep better count! I have never made gingerbread cookies before and wanted to try these as the spice mixture looked really good. They were fantastic and very aromatic, but I agree when you bite into them all I taste was overpower of molasses sorry…they were very dark and not as soft and chewy as I hoped….not sure if it’s because of the dark brown sugar I used and molasses overload…..I will try them again but cut half the amount and try adding some milk to soften them up, do you think that will work? Hmm, I’m not sure about those adjustments. Be sure not to overmix and handle as little as possible when rolling out – that might help keep these softer for you. I just finished making a batch of these cookies. This is by far the best recipe I have ever used. I love the mix of spices! The gingerbread is so flavourful and VERY chewy. I used cookie cutters of various sizes and shapes, most around 3″, some 4.5″ and some 1.5″, I was able to make 102 cookies!! I’m so glad they turned out well for you! And yes, it does make a lot of gingerbread! Honestly, I know most bakers use unsalted butter, but I never buy it. I just use salted butter. The amount of salt in salted vs. unsalted isn’t enough to make me notice any substantial difference in taste in baked goods and I prefer salted for other uses like toast or savory cooking. Salted butter does not actually have salt mixed in with it, The salt is ONLY sprinkled onto the waxed paper, therefore only being on the outside of butter block. What? I have never heard that before! Mind=blown! Totally disagree with commenter who said cookies were too spicy. They’re perfect! Love the flavor! Thanks for posting! Thank you so much Jessica!! I’m glad you love them! I left out the clove, nutmeg and allspice because I didn’t have any…and the family loved them! Soft and chewy. Couldn’t stop eating them. If I had left the extra spices, it may have come out too spicy for my taste. I’m glad your family enjoyed these! Hello, the dough turned out crumbly and not too held together, is that ok? What should I do? Oh no! It sounds like maybe something is missing or maybe an extra cup of flour was added? The dough shouldn’t be crumbly. I’ve been thinking about the difference in comments and am wondering if the crumbly comments are just because the dough hasn’t been smooshed together yet? I supposed it’s a bit of a crumbly dough, but I just mash it into a ball and refrigerate it and then it rolls out fine. Now, if it’s more sandy and won’t mash into anything, then that would be a bigger problem, but that has never happened to me when making these. I truly prefer a CHEWY to CRUNCHY cookie, so before I mix these up, can anyone comment? I’m with you – I like my gingerbread soft and chewy always! These are definitely chewy and not at all crunchy! Just be sure to pull them out right on time, or if you are really concerned, go ahead and underbake them by a minute or two! Made my dough yesterday and put in Ref overnight. Dough was moist and easy to work with, just remember to flour the table so they do not stick when rolling out. Did several different sizes and shapes, including larger Gingerbread Men. Adjusted the baking time to make sure they are not overdone or underdone. Keep your eye out. Turned out perfect. SPICY, AND MOSIT AND CHEWY. WE love them. Will be making them every Christmas from now on. Try them you will love them. Thank you, Carole! I’m glad you liked them! I dont think my dough was the proper consistency. It was very crumbly when I put it in the fridge and now its just cold hard and crumbly. Not rolling properly at all. I’ve added some water to it and am letting it warm up to see jf it is salvageable. I’m wondering if its just the dry environment I live in. I don’t know. It seems to me like this sounds like more of a case of accidentally adding too much flour, either by miscounting while adding (I’ve definitely done that!) or possibly improper measuring? Because the dough should be soft and it would surprise me if environment factored in that much. I’m sorry it doesn’t seem to be working out this batch! 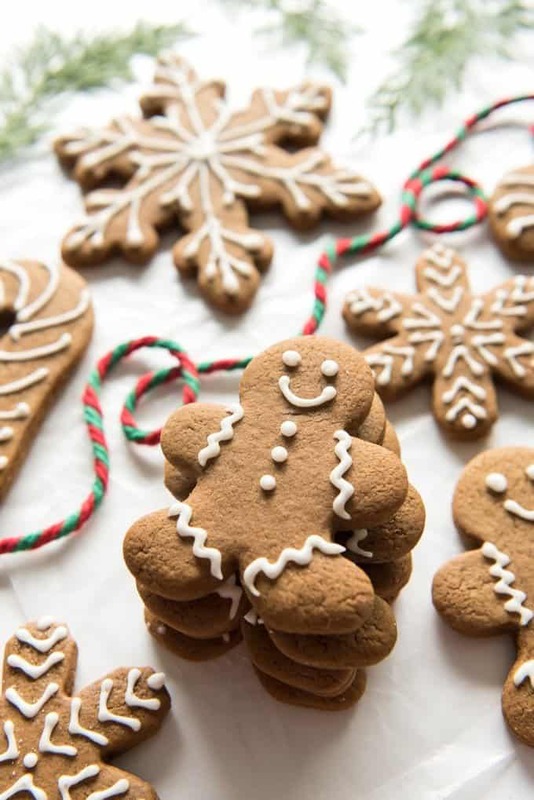 I tried this recipe and it is the best gingerbread recipe ever. Totally disagree about the spices being too much. It is PERFECT !! And the dough is beautiful, beyond beautiful. So soft so easy to roll out. I chilled my dough for 2 hours then pulled off a piece to roll out my large gingerbread man. It rolled so easy. What a JOY !! I baked mine for 9 min. still a little underdone but that’s okay. That’s why I only cut one. I’m trying to get the time down right. LOL But Amy, THANK YOU so much for sharing this recipe. It is AMAZING and you are right, if they didn’t end up with a beautiful soft, pliable dough, they measured wrong !! I now can rest , I have found the perfect recipe. Thank you… Happy Holidays !! THANK YOU! Seriously, I really appreciate that you took the time to provide such a glowing, thoughtful review! Decided on this recipe, versus many other I’ve found, because of it’s wonderful spice collection. However, when I pulled the dough out of the fridge it was crumbly and hard (as though it was missing some kind of liquid). I thought, at first, that I had done something wrong, but after reading the comments, saw that others were having the same problem. Very disappointed. Nor does the royal icing recipe work. Will try another recipe from elsewhere and compare results. I made the dough last night and let it chill in the fridge overnight. The dough was a really nice moist consistency! I had my husband roll the dough out for me this morning because I’m a weakling 😋. I used 3 different larger sized cookie cutters and baked them for 8-9 min. They baked up beautifully! The smell was amazing and the taste is even better! Just the right amount of spice and so soft and chewy! Quite a few got eaten before I even had time to ice them. These will definitely become a Christmas time regular in our home. Thank you for the recipe! PS: some of the reviews I read for this recipe were way off in my opinion. Can you freeze or refrigerate the dough if you don’t use it all? And if so for how long? Absolutely! You can refrigerate the dough for up to 5 days or freeze it for 1-2 months. What about freezing the cookies, then icing them later? Absolutely! That would work really well. I baled these last year. They were scrumptious. I will definitely be baking them agin this year. In my opinion, you cant hve too much spice. I thoroughly enjoy the stong spicy flavor. Thank you for sharing this fine recipe. Do you freeze your dough in one big piece or do you freeze your individual shapes? How do you thaw? 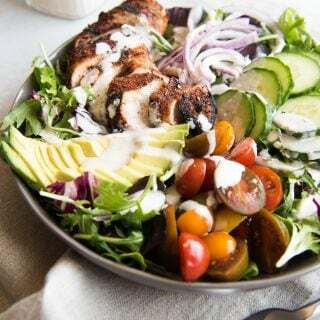 I would freeze it in one big piece, then let it thaw overnight in the fridge and rest on the counter for 20-30 minutes the next day until it is pliable enough to roll out. I’ve baked these twice and they are the best! Our family is now dairy free, however. I was wondering if you know of a good substitute for the butter? 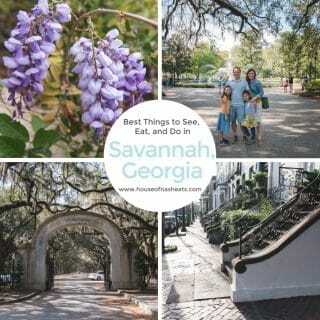 I’m so glad you love these as much as we do! 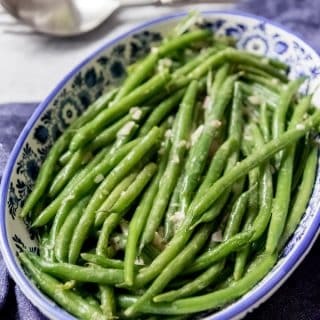 Have you tried using butter-flavored vegetable shortening? That would be my first choice, although I haven’t tried it in this recipe before. If you do, let me know how it works! 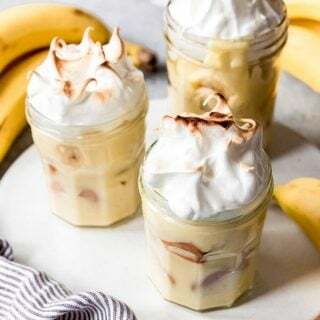 I’m so glad you commented to say that this recipe worked well for you! I’m honestly surprised that so many commenters seem to have difficulty with this dough, which has never given me any trouble at all! I put the ingredients together last night. The dough is still sitting in the refrigerator. But like some other reviews it is crumbly and hard to touch. I also felt like a liquid ingredient was missing. Maybe once I take it out of the refrigerator and roll it out it might be better? But at this point doesn’t seem like it would be so. Pretty confident my measurements were pretty close. While mixing I did feel like it was too much flour and that was after 2 cups of flour. Flour was flying everywhere while mixing it. I’m starting to wonder the same things, Lisa! 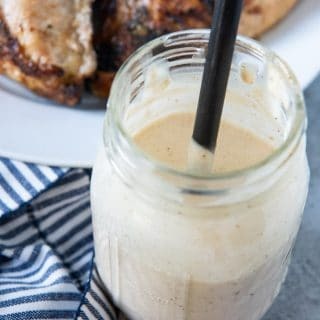 It’s so surprising to me that some commenters are having a hard time with this recipe because I have literally made this dozens of times without a problem, but it’s more than one person who seems to be having difficulty while otherwise have no trouble whatsoever. But it definitely should seem like 2 much flour after just 2 cups of flour with this much butter, egg, and molasses! I’m so glad it worked out for you and that you enjoyed these cookies! 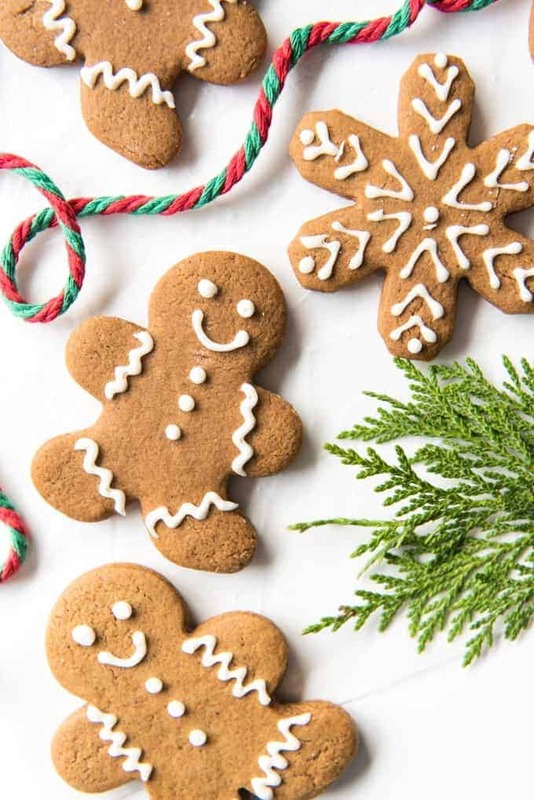 Am going to try this one – made gingerbread for the first time yesterday and it was…~fine, but sort of light a fluffy cookies, if that makes sense? I want dense, dark and chewy, hoping this will be better, and with the right amount and mix of spices that mine had, which tasted good. 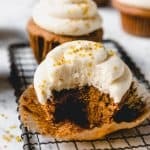 Looking at other recipes they only put cinnamon and ginger in?? What?? I had made this recipe three times last year; everyone agreed they were the best gingerbread cookies. They were both soft and sweet with nice spice. This year however they turned out darker, harder and bitter. Still.good, but nothing like last years batches. I realized the only difference between the two yrs was this year I used blackstrap molasses (i bought it for its added iron) whereas last yr I used fancy. Lesson learned. 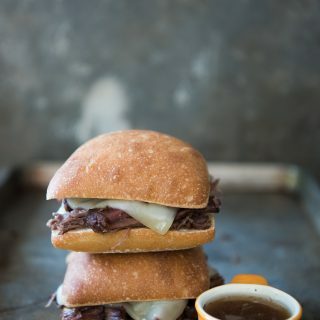 After a bit of googling I’ve since learned blackstrap js mot recommended for sweets/baking and is better suited for bbq sauces and beans and such. Anyways, lol, I’ll be remaking these again. They are seriously amazing when done proper. Thanks for the tip to steer clear of the blackstrap molasses! I’m glad you love these cookies and figured out the issue with the bad batch! I am going to have to update this post with that distinction! I had some major issues trying to make this dough, although I will be honest I did not freeze it or put it in the fridge for 3 hours (only about 15 minutes in the freezer). I ended up adding shortening until I felt it was more dough like (150ml) and I am so glad I did. I was able to cook these right away for 8 minutes and they were absolutely perfection. So overall THANK YOU for this recipe I still love it even though I tweaked it a bit. Followed the recipe exactly- let it sit in the fridge overnight- and the cookies turned out absolutely perfect! These are the best gingerbread cookies I ever made. The spices are perfect, I made it 7 days ago and it is still soft and yummy. These are so delicious! I had to transition to gluten free eating so I used King Arthur’s cup for cup flour and it worked really well. My kids loved helping me cut these out and decorate them. They each chose their favorite ones to leave for Santa. Thank you so much! You are welcome! And I’m glad to know it worked well with King Arthur’s cup for cup flour! Mine turned out too crumbly also and I know I did not miscount. Maybe it is the dry environment. Not sure. I am not a baker and am generally hopeless at cooking (and have really crummy tools – mix by hand and a tiny old oven that heats unevenly)…. 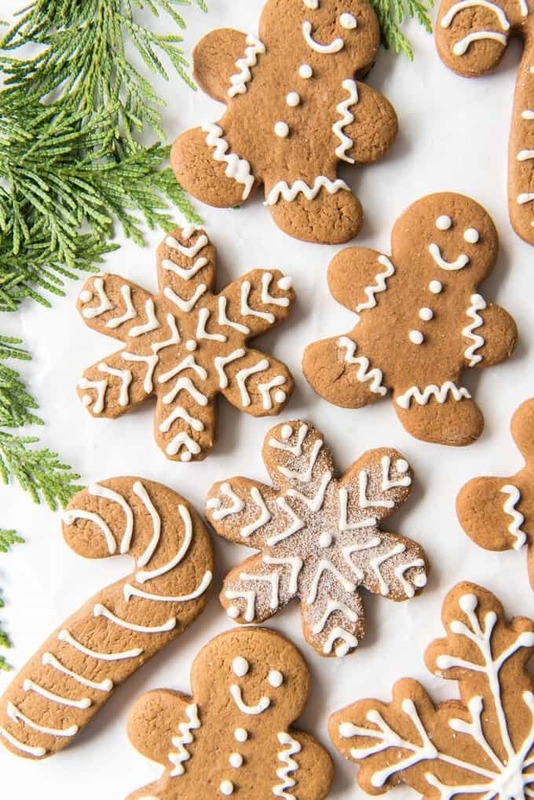 yet despite this, these gingerbread cookies have worked out deliciously every time and are by far the best gingerbread cookies I’ve ever tasted! 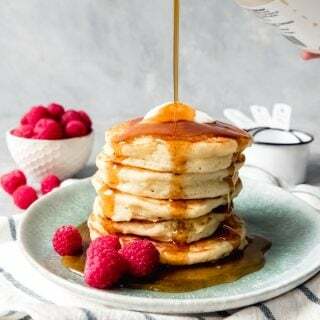 One time I had to substitute the molasses for maple syrup as I find Molasses notoriously difficult to find in my rural HK grocery store – the cookies came up a lighter colour, but were still delicious, soft and chewy (although I prefer the molasses version).